THIS is one of the titles of the Blessed Virgin, which is especially hers from the time of her Assumption and glorious Coronation at the right hand of her Divine Son. How it belongs to her will be plain by considering some of those other instances in which faithfulness is spoken of in Holy Scripture. The word faithfulness means loyalty to a superior, or exactness in fulfilling an engagement. In the latter sense it is applied even to Almighty God Himself who, in His great love for us, has vouchsafed to limit His own power in action by His word of promise and His covenant with His creatures. He has given His word that, if we will take Him for our portion and put ourselves into His hands, He will guide us through all trials and temptations, and bring us safe to heaven. And to encourage and inspirit us, He reminds us, in various passages of Scripture that He is the faithful God, the faithful Creator. 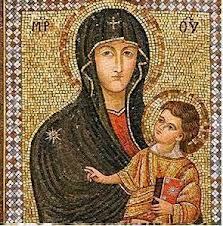 Mary, in like manner, is pre-eminently faithful to her Lord and Son. Let no one for an instant suppose that she is not supremely zealous for His honour, or, as those who are not Catholics fancy, that to exalt her is to be unfaithful to Him. Her true servants are still more truly His. Well as she rewards her friends, she would deem him no friend, but a traitor, who preferred her to Him. As He is zealous for her honour, so is she for His. He is the Fount of grace, and all her gifts are from His goodness. O Mary, teach us ever to worship thy Son as the One Creator, and to be devout to thee as the most highly favoured of creatures.